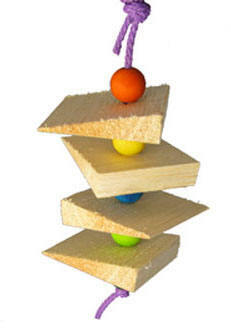 This is a simple toy, hung on poly rope, separated by colorful wooden beads and wedges of soft, chewy balsa in between the beads! There's a loop on the top so you can use your own quick link (and helps keep costs down). If you want a quick link ... click here to order. Great for smaller birds who enjoy gnawing on balsa! The birds love those balsa angles for beak teasing fun!